TEXT GIVING: Giving thru text is as easy as 1-2-3! 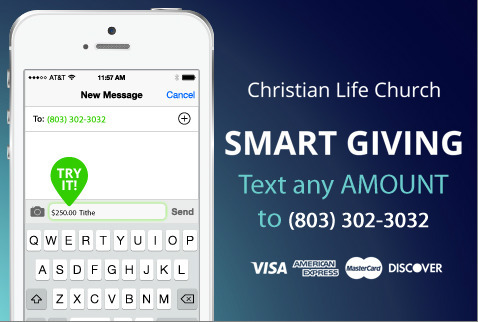 Text your gift amount and one of these 6 fund options to the church's Smart Giving number: 803-302-3032. Options: Tithe, Missions, SCSL, Benevolence, Building. You may schedule your text giving! Text the word GIVE to: 803-302-3032. How to edit? Text the word EDIT to the church's Smart Giving number: 803-302-3032. You do not have to be a member of Christian Life to register for LIFE LINK. Anyone can sign up and make online contributions, and register for events.